It’s a sleek entry into a world of 27-inch all-in-ones that are universally chunky. 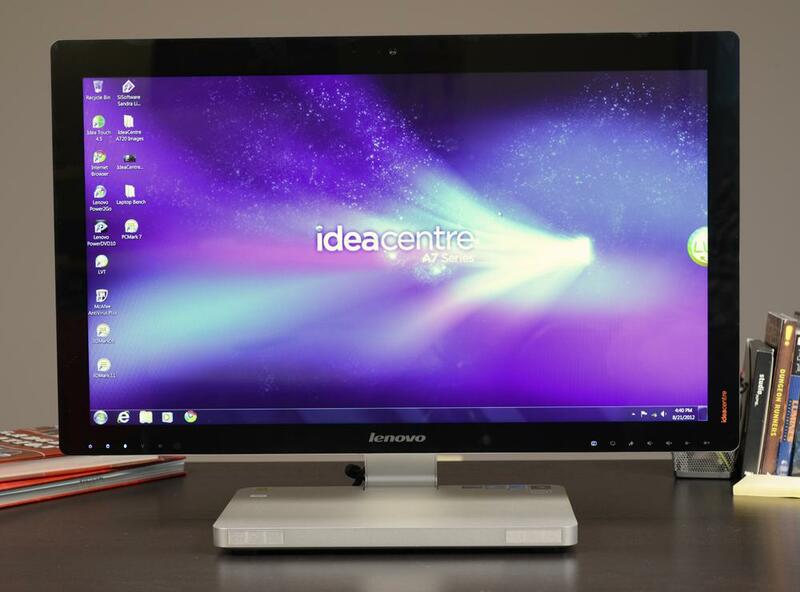 The IdeaCentre A720 is Lenovo’s flagship all-in-one, and its entry into a plus-sized 27-inch market that includes Apple’s iMac and the Dell XPS. Like those big-name competitors, the A720 does not try to be inexpensive. Even the most basic configuration sells for $1,699. That nets you an Intel Core i7-3610QM processor as well as Nvidia GeForce GT 630M graphics, 8GB of RAM, 1TB of storage and a Blu-ray drive. Spending more adds a TV tuner with remote. The top-end model adds a 64GB solid state drive. We received the mid-range version with a tuner, but no SSD. The price of this version is $1,719 on Lenovo’s site, which puts in right in line with the XPS One and the basic 27-inch iMac. Let’s see if the A720 has anything those models lack. We were surprised by the box the A720 arrived in. Unlike that XPS One and HP Omni 27, both of which shipped in huge packages, this PC showed up in a slim, simple, and light container. Digging the all-in-one out of its foam and cardboard revealed why: The A720 itself is slim, simple, and light. Most current all-in-ones place all of the hardware behind the display, but this one instead puts the hardware in its thick silver stand. That means the display can be much thinner – and more attractive – than the competition. This is the world’s thinnest 27” all-in-one. Lenovo didn’t just design a thin profile and call it a day, however. The company paid attention to the details. Every exterior surface besides the display is made of flat metal. Panel gaps? There aren’t any. Even the display is stylish thanks to a relatively thin bezel and the inclusion of cool white-LED touch buttons along the front. Design has its victims, however, and one of them is connectivity. We were somewhat surprised to find that the A720 offers only four USB ports (two USB 2.0, two USB 3.0). It also includes a card reader, headphone and microphone jacks, and HDMI. Both the Dell XPS and HP Omni have far more ports. The lack of a solid audio-out selection hurts given the media center potential of this PC. The coaxial connector for the TV tuner is funny, as well. A full-sized connection is not included. Instead, users have to connect an adapter to a tiny co-ax port on the back of the A720 and then connect to that adapter. The A720, like the HP Omni 27, ships with a 1080p display. That sounds wonderful until it’s compared to the 27-inch iMac and the Dell XPS One, both of which have a resolution of 2560 x 1440. Noticing the missing pixels isn’t hard. Small text looked jagged and rough instead of smooth, and 1080p videos lack sharpness when viewed from a few feet away. Test images revealed that the panel performed well. 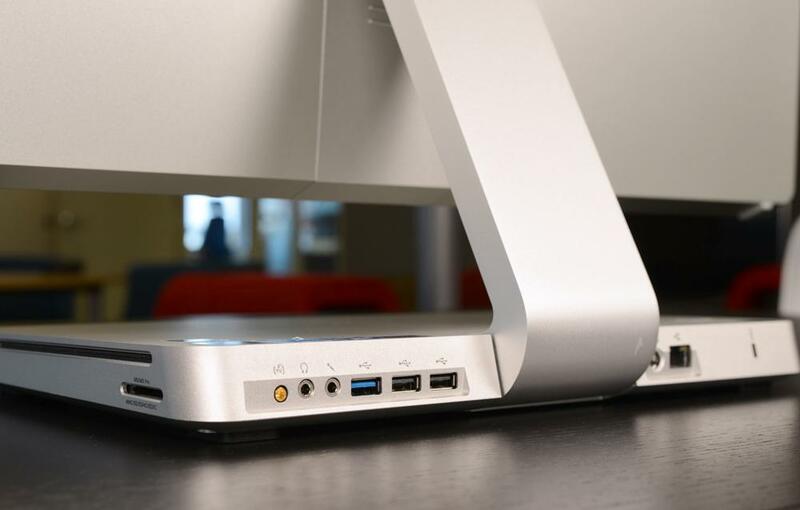 Users could mistake it for an IPS panel, except for one obvious problem – viewing angles. They’re limited and, because the panel is so large, the screen never appears 100-percent uniform in test images. This is another potential roadblock for those who want a PC media center. Unlike the competition, the A720 has a standard touchscreen. It’s a 10-point unit that feels responsive. We’ll go more into the touch-centered apps in the software section of this review. This all-in-one lacks speakers inside, below, or beside the display. They are instead placed inside the stand, but the room available there is limited. Lackluster audio quality is the predictable result. Maximum volume blasts, but lacks the low-end to back it up, creating tinny and sometimes distorted audio. You’ll need to hook up external speakers for a satisfactory media experience. Lenovo’s decision to buck the trend of making 27-inch units without a multi-touch display option strikes us as unusual, particularly considering the A720’s relatively low resolution. If you’re close enough to touch the screen, you’re certain to notice that text isn’t fine, and sharp edges appear a bit jagged. A suite of touch software is included to make the experience friendly. Unfortunately, most of it is poor. The Idea Touch interface has just six areas for various media, games, and widgets. Most of your PC simply isn’t accessible from this display and, to make matters worse, customization is limited. You can access Angry Birds, however, which is great if you ever felt the need to play the game on a 27-inch screen. Strangely, Lenovo also includes a separate touch interface called Lenovo Vantage Technology. Some of the functionality of this interface, such as the ability to open games, overlaps Idea Touch. You can also access some pre-installed apps, but we couldn’t find a way add new ones. 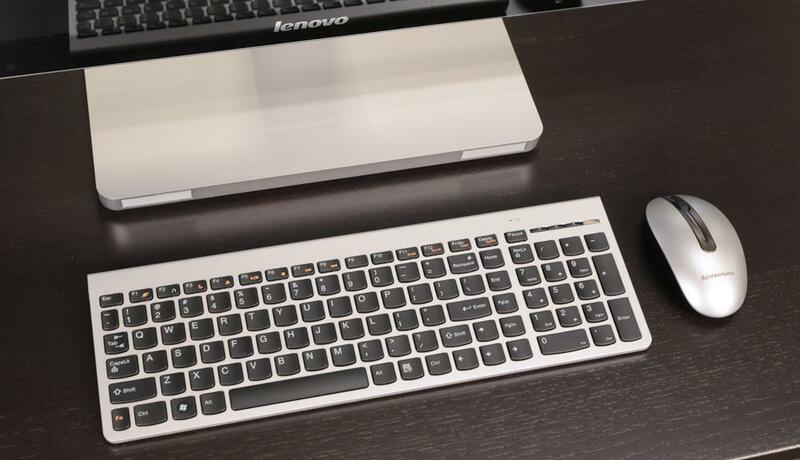 Lenovo has you covered when you become tired of waving your arms around and want to go back to a more useful interface. A wireless keyboard and mouse are included, and both work well. The keyboard is similar to those found on Lenovo IdeaPad laptops. Keys are large, separated by wide spaces and provide a reasonable amount of travel when pressed. A numpad is included. Our only complaint is the size of a few specific keys. Tab, for example, is smaller than a normal letter key. We were surprised to see that the wireless mouse, which includes two buttons and a clickable scroll wheel, uses invisible laser technology. That means the mouse can be used on any moderately smooth surface and there’s no annoying red LED waiting to shine in your face if you accidently turn the mouse over. We’ve compared the performance of all-in-one computers to laptops in previous reviews. That is because they often include some mobile hardware and a low-voltage desktop processor. The A720 takes this a step further by including the Core i7-3610QM, a processor specifically designed for laptops. It turns out that this choice does not cause much reduction in performance. SiSoft Sandra’s Processor Arithmetic benchmark turned out a score of 88.51 GOPS while 7-Zip reported a score of 18,607. Both of these results are behind the Dell XPS One, which scored 103.29 and 20,934 respectively, but the gap is manageable. PCMark 7 was much less favorable, returning a total score of 2,706. This is far below the XPS One’s score of 4,485, but about on par with the Omni 27’s score of 2,736. The main factor in the Dell’s better score is the inclusion of a solid state cache drive, something not found in our A720 review unit. All versions of this all-in-one come with the Nvidia GT 630M GPU. This is a part designed for laptops and it provides scores that are low. 3DMark 06 reached a score of 9,400 while 3DMark 11 hit a score of 1,304. Games that are not graphically demanding will run well on this system, but knock-out titles like Skyrim and Battlefield 3 will only be playable at low to medium detail. 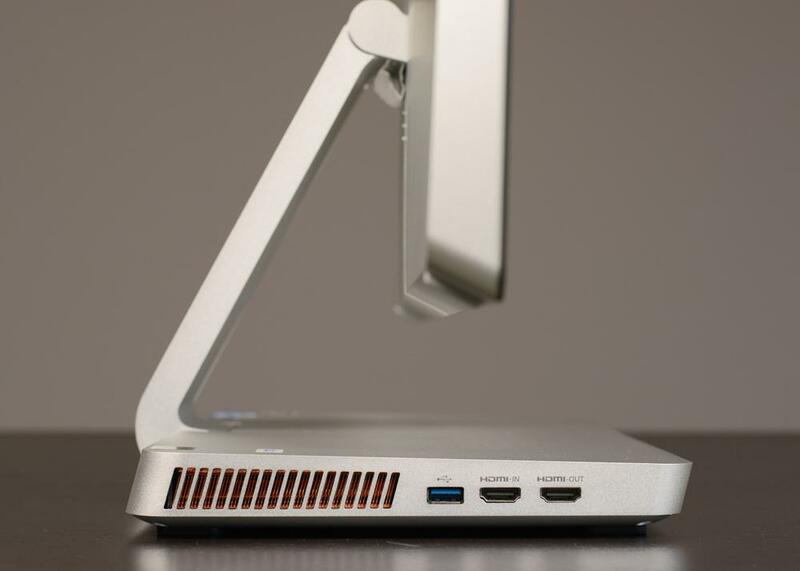 All of the hardware powering this computer is crammed into a stand which is about an inch and a half thick and no wider than a 13-inch laptop. This situation creates an obvious cooling quagmire. How do you keep all of that cool with so little space to move air? The answer is a persistent fan. It never shuts off, even at idle, though it is usually drowned out by ambient noise. Placing load on the computer increases the fan noise further. Unless you own a gaming laptop, an A720 that’s being used to play a game will be the loudest device in the room. Heat still can become an issue despite the fan. Most of the base warms to temperatures between 96 and 99 degrees Fahrenheit. That is enough to create a noticeable bubble of warmth around the device. The honeymoon quickly wore off, however, as we started to notice some flaws. The A720’s touchscreen seems pointless given the lack of a good touch interface. Performance is behind the competition. And the display doesn’t serve up as many pixels as it should. Another major issue is the lack of solid multimedia features. A TV Tuner is available, but the computer lacks what is needed for a good television experience. Audio quality isn’t great, the display’s viewing angles could be better, and there’s not enough video and audio connectivity. All of this might be excused by a low price tag, but Lenovo prices this product right in line with its competitors. That makes the A720 a poor value. We’ll remember this all-in-one fondly, but we recommend committing to a different product.